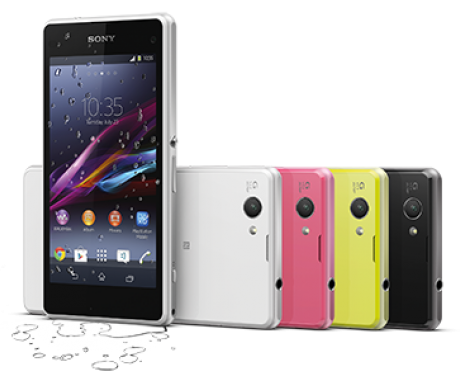 The Sony Xperia Z1 Compact (D5503) was introduced in January 2014 in black, white, pink and lime. The phone itself has a 4.3” HD TRILUMINOS™ shatterproof and scratch resistant screen with a dustproof and water resistant body (over 1 meter and under 30 minutes). Also includes a Snapdragon 2.2 GHz, quad-core processor with a 2GB RAM. This device is released on 4.3, aka Jelly Bean, and is upgradable OTA to Kit Kat. Already with 16GB of internal memory, if that’s not enough you can expand it with a micro SD card up to 64GB. Being an Android device, you get all the same features and applications as any other Android device but you’ll get a more advanced gaming experience. With Adreno 330, an upgraded GPU, you’ll get an advanced and visually amazing 3D gaming experience. It also lets you browse the internet much faster without eating up your battery. Like most Xperia models, this does not have a removable battery. But inside is a Li-ion 2300 mAh battery providing up to 18 hours of talk time or 600 hours on standby! Don’t forget about Sony’s Stamina Mode feature, again, exclusive to Xperia models. Stamina Mode gives you the ability to customize how you want to conserve your battery while on standby mode. Last but not least, you also get a 20.7MP camera with Exmor RS and their award winning G Lens. Another Xperia feature. Exmor RS is also included in Sony cameras and camcorders, giving you the most stunning color and clarity in all your pictures in ultra HD. The Z1 Compact is a pentaband device, just like the Z1. Once unlocked, you can use it with any carrier worldwide!